Compatible with VPCart V4.5 to V8. MultiBuy discounts all relate to Quantity-Related discounts. This is intended for special offers where you have multiple products that are part of an offer, where those products can be "counted" in any combination (ie it doesn't matter which of the products you grab off that "discount shelf", each product is counted as an item that's part of the offer). eg for a buy-1-get-1-free, you can buy any 2 items from the discount shelf (the same item, or different items) and the cheapest one will automatically be free. More Info on "Discount Shelves"
The easiest way to explain how these discounts work is to think of your online store as having physical shelves with products on them, where a given shelf has a given discount offer and where there's a selection of your products on each shelf. eg you might have a "Buy-1-Get-1-Free" shelf, and a "3-for-2" shelf. You can have more than one shelf displayed/active at the same time. You can have a given product on more than one shelf at the same time (eg a product can be part of a buy-1-get-1-free offer as well as being available for a 5-for-3 offer). The processing of the MultiBuy discounts will never apply more than one multi-buy discount to a given quantity-unit/item in the cart; it will always pick the most appropriate offer for the item (if more than one offer is relevant to it) and apply that discount. The discount is displayed at order-level (ie at the bottom of the cart, added to the discount total), and it's also taken into account when the mini-cart total is shown in your header/trailer. The processing/calculation will go through your mini-cart, work out which quantity-units/items are discounted, calculate what the discount is, and then will display the total discounted amount at the bottom. The items that get discounted will always be the cheapest ones in the cart which relate to that offer. For example, if you have a 3-for-2 offer and you have 2 items in the cart which have a normal price of $100 each, and you have 1 item in the cart which has a normal price of $150, then the logic will automatically apply the discount to one of the $100 products. ie the customer will be charged a total of $250 - the full price for the $150 item, full price for one of the $100 items, and the remaining $100 item will be set to free. 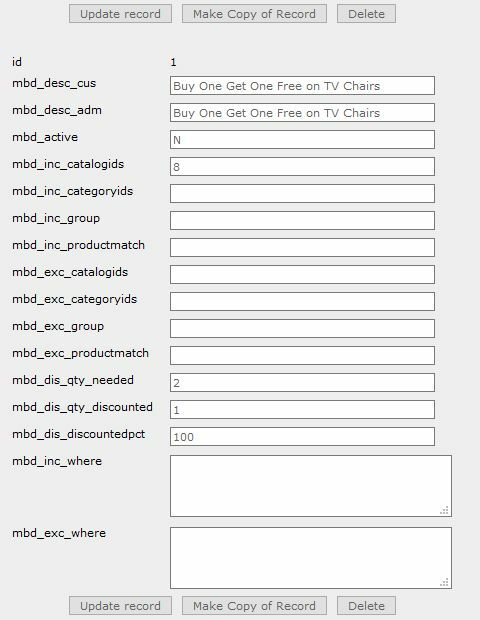 To setup a "shelf" (ie to create a discount offer and define which products are on that shelf), you simply create a new record on the mbd_multibuydiscounts table (the MultiBuy Discounts admin menu item that you add during installation is how to access this table/data). Each mbd_multibuydiscounts record relates to one "shelf" - remember that a product can be on more than one shelf, and there can be as many shelves as you want, and each shelf can have any discount rule that you want. 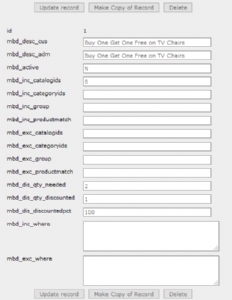 The mbd_multibuydiscounts record is NOT a manually-entered matrix of discounts/products data, it's much more flexible and easier to use; the discount record specifies search criteria for which products are on the shelf, and specifies optional additional exclusion criteria for what you want to take off the shelf, and holds the qty-needed and the qty-discounted and the discount-pct values for the offer/shelf. this offer relates to all products that are in categoryids 1,2,3, or 4, but it doesn't apply to products which have a code that starts with "A". For the inclusion and exclusion criteria, you can use categoryid lists, catalogid lists, productmatch lists, group-for-discount lists, or you own where clause where you can specify anything you want.